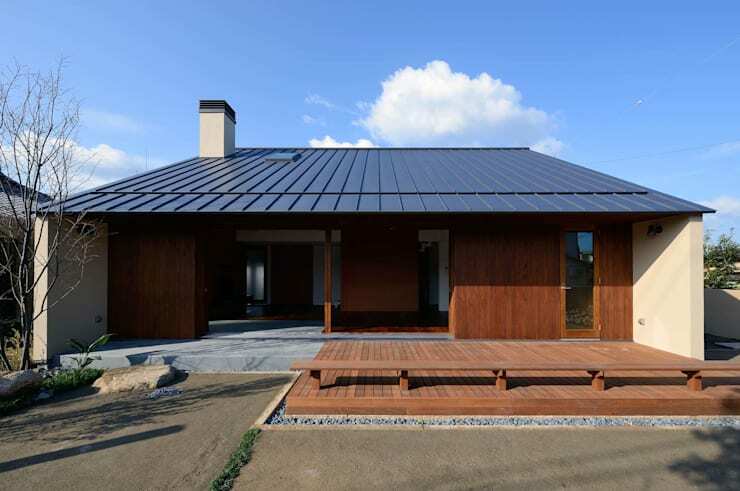 Today on homify 360°, we travel to Kyoto, Japan, to scope out a 146 m² home that was designed by Masahiko Sawamura Architects and Associates. But even though this is a two-storey structure, it appears to have only a ground floor from the outside, as the second level (a mezzanine) is built into the roof space. But what really makes this house a visual stunner is its construction materials, which include concrete, zinc, glass and wood – and it’s the wood, especially, that gets prime attention, for it oozes from the external façade through to the insides to style up the interior spaces. 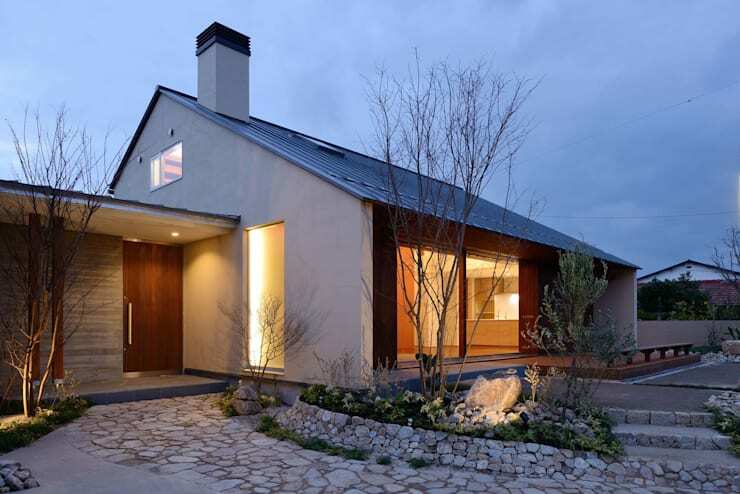 The exterior of the house assumes a conventional typology, opting for straight lines and clean angles. The interior, on the other hand, embraces soft curves and other interesting details which make it a more eye-catching space. For the façade, both concrete and wood battle it out to get the most attention. The supporting walls are cast in concrete and capped with a low-slung gable roof, while the other walls are finished in timber, as are the doors which can slide open to reveal the interiors. For the landscape, a more organic look was opted for, with a beautiful combination of pebbled surfaces, stone flooring and dense plants forming the basis for the exterior garden touches. From this angle, we can see that a firm amount of zinc also comes into the picture via the roof. Notice how the lines on the roof, as well as the timber panels of the terrace outside, lead our eyes towards the middle to scope out the interiors, which become more prominent the wider those wooden doors are slid open. Stepping through the large openings, we seamlessly transition between the interior and the exterior: no step, and no change in flooring. The stone pavers continue into the interiors for a few metres before suddenly transitioning into a wooden surface clad in rich, warm hues. 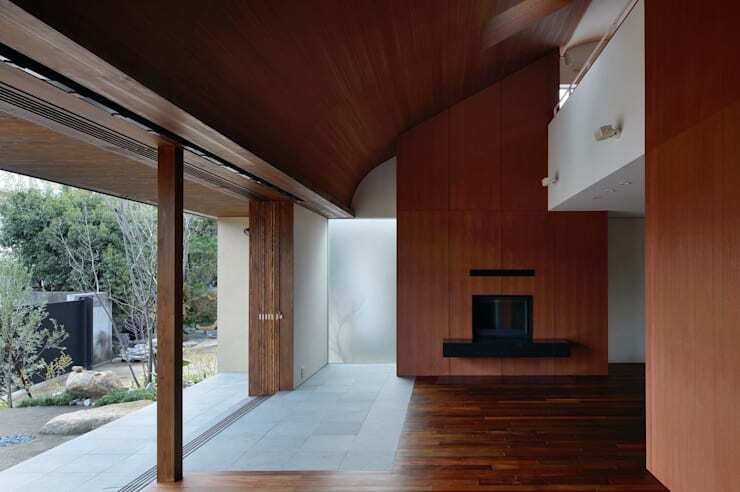 Don’t think that the top parts of the interiors have nothing to show off – although the exterior roof surfaces were more strict in their linearity, the interior ceilings opt for a softer and more organic approach. 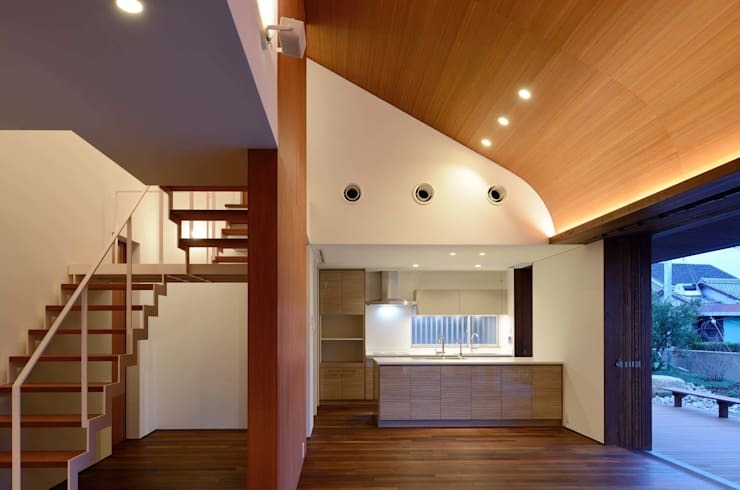 Lined with timber, this ceiling becomes the star of the space! Right underneath the curvy ceiling we locate the kitchen. The long open-plan layout right next to the culinary corner treats us to an open-riser staircase, with wooden treads, that lead to a mezzanine space upstairs. 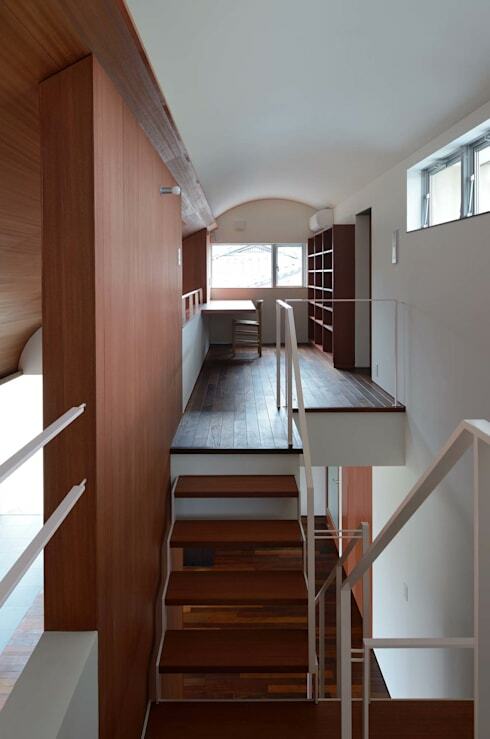 This little mezzanine space might just be the quirkiest space in the entire house. It also gets treated to its own curved ceiling, although this one is a smaller, less dramatic version of the one we saw downstairs – and it’s coated in snow white. Here is where a quaint little office area has been set up, which also affords the user a prime lookout spot over the social activities going on below. Before we conclude this tour, we treat ourselves to one beautiful framed view of the garden seen through the ground-level windows. 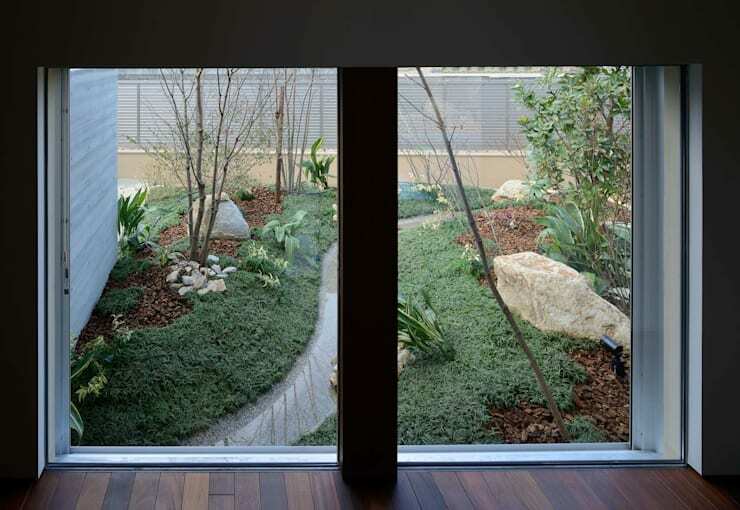 This view provides a stunning and unexpected, yet most welcome view of green lushness, which is quite contrasting with the rest of the structure’s external and internal settings. The perfect little touch to enhance this (mostly) timber home. Speaking of Asian-style homes, have a look at The Small but Very Impressive House!